Flowers, Chocolate and a Candle - perfect. We can customize this to suit your preferences, this is just one example. Prefer roses over gerberas? We can do that. You tell us what you need and we design it. 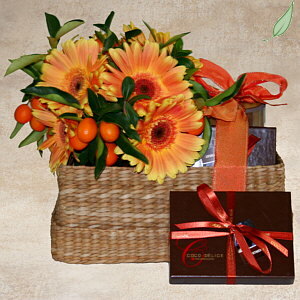 In this viewing, we have bright gerbera daisies paired with kumquats and packed together in our seagrass box with Coco Delice 12 piece chocolate box and our tall mosaic candle holder. What can we put together for you or someone you know?